Last weekend, Gerle Kittler, 25, woke up on a train platform in Warngau, Germany. At the time, he was laying outdoors on a couch and found himself being asked questions by some police officers. Gerle had no idea where he was or how he got to the train platform. He did, however, recognize the couch-- it looked a lot like the one that was at his friend's house. It seems that Gerle fell asleep at a friend's party the night before. He apparently had not been drinking too much... he is just a notoriously sound sleeper. His friends wheeled the couch out of the house (complete with sleeping Gerle) and rolled it one mile to the nearest train station. They then bought Gerle a ticket and bought an additional "bike" ticket for the couch. Gerle never woke. 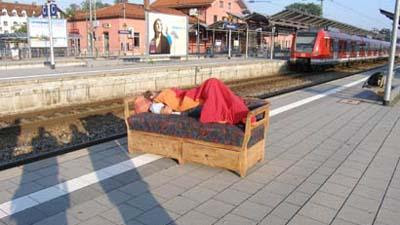 When the train arrived, they loaded Gerle-and-couch onto it. Presumably, some of his friends rode with him and unloaded him on a train platform four miles down the line. That is where they left him... alone, asleep on a couch. To make matters worse, it appears that they also took his wallet and cell phone-- leaving Gerle without any ID and no way to pay for the fare back home. Said Gerle, "I always sleep like a baby so I didn't notice anything until the cops shook me awake and demanded my ID. I thought I was in the middle of a bad movie." That's hilarious! I love all the shadows in the background taking pictures of him.